Ryan Carney, a paleontologist at the University of South Florida, is working on developing interactive holograms of dinosaurs that allow people to see, touch and play with a number of different species without having to travel to a museum. Carney runs a course at the university's Center for Virtualisation & Applied Spatial Technologies where students are tasked with digitizing fossils using X-ray, laser and photogrammetry techniques, and then creating 3D representations. Those representations can be used in a number of ways – as holograms, in virtual or augmented reality, or even 3D-printed. The goal is to help people understand the anatomy and motion of dinosaurs, for research or educational purposes or just to get people excited about science. Among the species Carney has digitally reconstructed are the raptor Deinonychus and the mollusk Protobalanus. 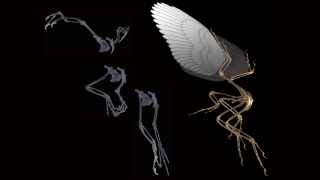 But his main research is into Archeopteryx – the link between dinosaurs and modern birds. Carney was recently inducted into the National Geographic Explorers programme. "What I love about science is the intellectual freedom to pursue the questions that truly inspire me, such as the mysteries of how flight evolved and what dinosaurs looked like," he told National Geographic. "I’m also inspired by the role that new technologies can play in discovering secrets hidden within fossils for millions of years—from imaging the insides of bones to detecting original pigments in feathers and skin!"